Only once in my life have I acted on a deliciously unethical impulse when it comes to food. I poached a man’s risotto, and I don’t mean in a bath of lightly boiling water. I stole it. A guy made risotto for me and I took it out from under him and served it to another man. It was our third or fourth date and this guy and I decided to have dinner at my place. I figured I’d contribute whatever was in my fridge at the time, somewhat wistfully imagining us dividing up a recipe together, chopping and prepping together at the kitchen island. But I guess collaborating is not what he had in mind. He showed up with every ingredient he needed to make risotto and a couple cuts of meat to eat along with it. He even brought his own knife. He took the helm of my kitchen as if he had cooked there hundreds of times before. He grabbed a perfectly sized All Clad pan, tossed in some butter and a few turns of olive oil, and sauteed the onions he’d finely diced. He added the arborio rice, patiently allowing it to toast and then slowly soak up the white wine, salt, chicken stock, butter, and parmesan cheese, transforming it stir by stir into the plump, creamy texture it is famous for. He seared the meat and served it alongside a heaping portion of risotto the fine color of a delicate bird’s egg. Unfortunately, none of his efforts in my kitchen that night did anything for me. We ate this great meal with nothing all that great to say. We eventually ended the evening with a sober salutation at the door and the leftovers of his heavenly cloud of Italian starch cooling in my fridge. Dear reader, this is where I argue the risotto entered the public domain. It’s not as though I sat back with twisted fingers concocting a clever plan for what to do with the decadent offspring of a failed date. An opportunity simply came along. The following night, I had a date with B, who also loves to cook. In getting to know each other, we talked about the food movies we’d like to watch together, like Mostly Martha, Ratatouille, and many others. That night, we decided to watch Big Night. A smile spread broadly across my face as I flashed from the risotto in my fridge to Primo the chef’s enduring passion for the familial risotto recipe that wends its way throughout the film. B and I burrowed next to each other on my couch with two plates of our bounty and two glasses of wine as Primo passionately dished out plates of risotto from the back of his kitchen. Since then, I’ve decided every home chef should be able to make risotto without following a recipe. It’s your ace in the hole, an adaptable base that will convey most anything you’d like to put in it. Martha Stewart sums it up by saying a well-made risotto is a “culinary feat. 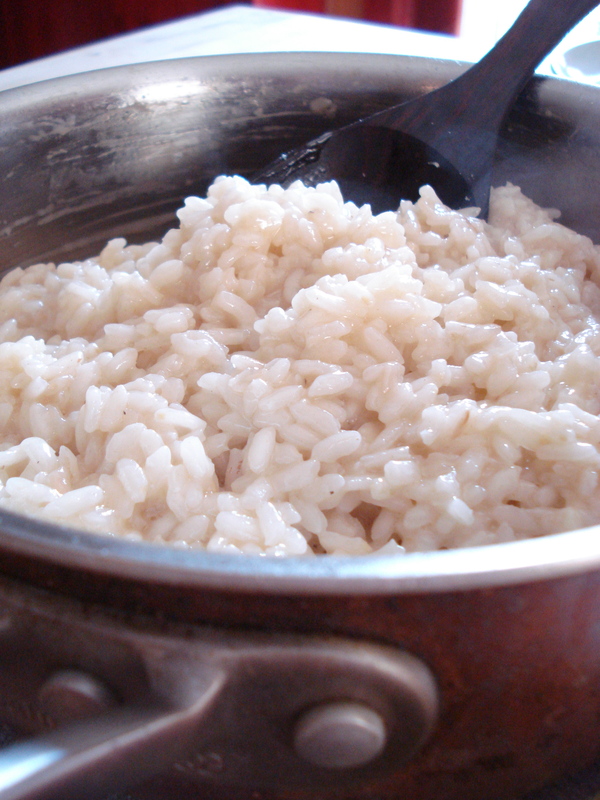 Small, firm grains of rice float, suspended, in a rich, creamy sauce.” Is that sensuous enough? I would describe the full process, but I couldn’t do it any better than Mario Batali and Mark Bittman in this charming video. Follow the recipe once and try to look at it never again. This entry was posted in Tete a tete (That's French for "dating"), Things I Make on July 14, 2010 by Carrie.